“Will Europe come to depend on Russian natural gas?” asked the Oil and Gas Journal in the August 28, 1961 issue, when natural gas’ overall role as an energy source in Europe was still negligible. 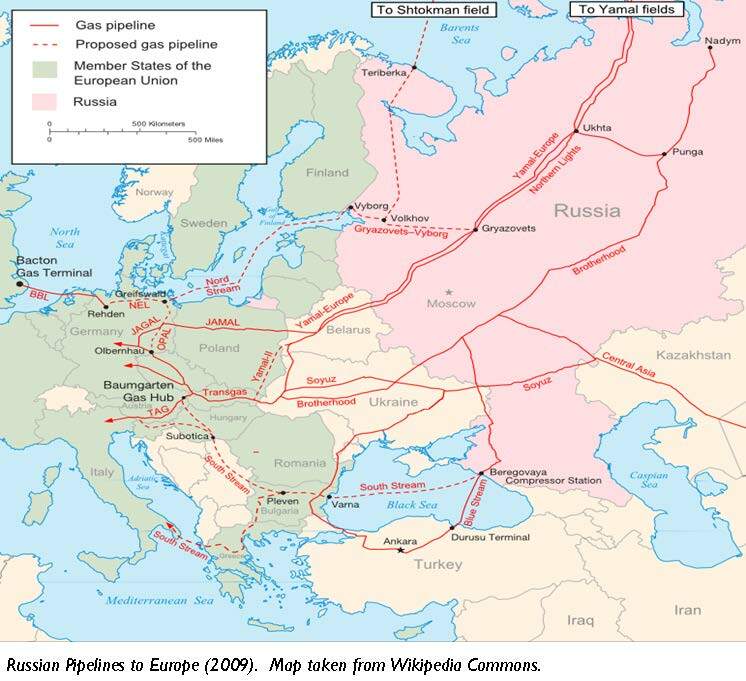 Today, as Russia has established itself as a major energy supplier, the debate about security of Europe’s gas supply and over-reliance on eastern gas is very much alive and has a factual basis: A vast pipeline infrastructure starting at the gas fields in Siberia feeds a large part of industry and house-holds in Europe. In August of 1961, however, the Berlin wall had been constructed and with the Cuban missile crisis, the Cold War reached new heights in 1962. And while substantial gas discoveries in the Netherlands and Algeria had caught the attention of the energy industry by that time, the Soviet Union was still struggling to develop its domestic supply infrastructure, and the gas riches of Siberia remained undiscovered. Yet, only a few years later, system-builders from both sides of the Iron Curtain managed to overcome ideological barriers and trade restrictions, each assessing that the opportunities would outweigh the risks of interdependence. Per Hogselius’ meticulously researched book tells the fascinating story of how it was possible for “red gas” to first cross the Iron Curtain. Per Hogselius’ meticulously researched book tells the fascinating story of how it was possible for “red gas” to first cross the Iron Curtain only 10 days after the Red Army had brutally crushed the Prague Spring and how later, despite strong resistance by the Reagan Administration, the Yamal-Europe pipeline could be built, following the widely criticized Soviet invasion of Afghanistan. By referencing material derived from national archives in Russia, Ukraine, and Western Europe, the author gives insights on the motivations of decision-makers in industry and government on both sides of the Cold War divide. Detailed account is made of contract negotiations, for instance, and light is shed on what was invisible to actors in the West at the time – the huge economic and human sacrifice that Soviet prioritization of exports over domestic use entailed. For Hogselius, “system-building” is a key concept for the understanding of the appearance and evolution of large technical systems. The author recognized that it was the presence of key actors – of both technical and entrepreneurial backgrounds – with the ability and mandate to drive processes forward, mobilize necessary coalitions across Cold War divides, and who were needed to overcome critical problems. In this sense, before red gas could flow abroad, natural gas had to find its place in the Soviet command economy. And here, Hogselius highlights the role of highly capable system-builders, like Alexei Kortunov, who drove Soviet gas exploration and network development under the newly founded gas ministry, Mingazprom, from 1950 onwards. Initial successes, continuing exploration finds, and the growing appetite for the efficient and environmentally friendlier fuel, led to increased support through the Central Party Committee, with political rhetoric keen to argue that large transnational industry projects are better worked out under communism. Successively, ever bolder production targets were set and a confident gas was able to challenge the position of oil and coal. Following connection to major cities such as Moscow, Leningrad, Kiev and the industrial heartlands, natural gas was progressively supplied to the wider Ukraine, Belarus, the Baltic republics, the Caucasus (from Baku) and later Czechoslovakia. The ambitious engineer-pioneers pushing development, however, soon recognized the limitations of the Soviet manufacturing industry’s ability to continue accommodating the fast and long-distance expansion of pipeline networks, especially due to the inferiority or lack of powerful compressors and large diameter pipes. At the same time, around 1965, it became increasingly clear that the Siberian Tyumen region held incomparably large natural gas reserves, which would have to eventually take over from the declining production in Western Ukraine. As imports from capitalist countries were strictly limited, machinery imports for gas export schemes were increasingly envisioned. However, the Soviet leadership – especially the central planning institution Gosplan – remained divided over the issue, with one of the biggest risks seen in over-dependence on gas purchases, i.e. security of demand. Finally, export plans were approved, in principle, in light of plateauing oil exports and the possibility to counter U.S. leverage over Europe. The use of outright gas supply disruptions as an energy weapon was never part of considerations. Large gas discoveries in the Netherlands and Algeria provided that private and public actors from countries geographically most distant from these new sources of supply and on best political terms with the Soviet Union would take the lead in negotiations with the Soviet Union, i.e. Italy’s ENI with its important customer base in the north of the country and Austria, later Bavaria. While northern Italy represented a larger target market, Austria led the way. A neutral country with a government-owned oil and gas company, OMV, that had actually been under Soviet controlled administration until the occupation of eastern Austria ended in 1955, Austria had a gas distribution network only a stone’s through away from the Soviet Bratsvo (Brotherhood) pipeline in Czechoslovakia. In order to honor this important export contract, and being technically unable to expand supply as planned, the Soviet Union prioritized export over domestic supplies, leading to severe shortages in Ukraine, Belarus and the Baltic states during successive harsh winters. It also helped the process that OMV’s indigenous gas resources were coming to an end and that the Austrian steel industry was increasingly under pressure from European Economic Community competitors, paving the way for a gas-for-pipes deal, export-financed by Austrian Kontrollbank. Interestingly, the drawn-out negotiations were supported both by the new Austrian center-right government, which was seeking closer integration with the EEC, and a Soviet leadership that sought to counterbalance West European dominance over neutral Austria. 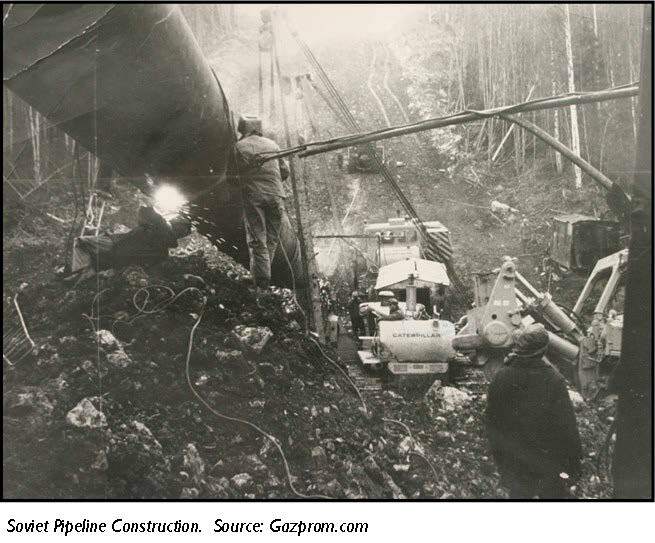 The first gas crossed the Iron Curtain in 1968 as had been contracted. Supply irregularities became insignificant after an initial period, leading OMV to view the project as a success. Associated human and economic tragedies were hidden to the West. In order to honor this important export contract, and being technically unable to expand supply as planned, the Soviet Union prioritized export over domestic supplies, leading to severe shortages in Ukraine, Belarus and the Baltic states during successive harsh winters. For Germany, following in the footsteps of OMV, was Bavaria’s gas utility and the regional government, who sought independence from northern German suppliers, especially Ruhrgas, in coping with the dawning natural gas production limits in Bavaria itself. Although the Bavarian initiatives found some support in government, backing of rapprochement with the Soviet Union through economic ties increased as Willy Brandt obtained the chancellorship and German ministries stood more strongly behind the new Ostpolitik, or “new eastern policy”, aiming at normalization of relations between West Germany and Eastern Europe, particularly East Germany. The U.S. Johnson Administration at the same time was not opposed to a limited German gas supply exposure towards the Soviet Union, and did not follow up on requests for intervention by gas producers Esso and Shell, which interestingly together had a controlling stake in Ruhrgas, who would lead negotiations. The view of energy experts had also changed from only a few years earlier, with expectations being now of a substantial supply-gap opening. German-Soviet negotiations commenced in June 1969 and were concluded in early 1970 with a gas-for-pipes contract including a government-subsidized German credit arrangement, which also testified to the strong political interest to support detente between Germany and Russia. Soviet deliveries would grow to 7.4 bcm in 1973, 17.2 bcm in 1974 and to 24.7 bcm in 1975. In parallel, Italy’s ENI and later Gaz de France concluded long-term supply contracts with Mingazprom, whereby Italy would be connected by way of Austria and France through a German pipeline extending from Czechoslovakia. Ruhrgas opted to increase contracted supplies in 1972 and additional supply contracts were concluded with Finland, Poland, East Germany and Bulgaria. Altogether, Soviet deliveries would grow to 7.4 bcm in 1973, 17.2 bcm in 1974 and to 24.7 bcm in 1975. The impressive new export obligations allowed for the Soviet side to plan for connection of the still-untapped Siberian gas fields, by making use of West European manufactured equipment. The technological feat to build multiple thousands of miles of pipelines partly through hardly accessible swamp and permafrost areas in time for the first planned deliveries in October 1973 proved impossible. The harsh, hitherto unknown construction conditions and continued state planning deficits necessitated that Soviet engineers improvise to avoid having to either default on export contracts, or to encounter domestic shortages. Gas deposits in Eastern Ukraine were supposed to substitute for declining production in western Galicia and thus free export volumes. This strategy failed as well. By September 1973 it became clear that export obligations could only be met by severely curtailing supplies to power stations, industries, and public users. As consumption restrictions were partly ignored, the situation became chaotic throughout the Soviet Union, with republics at the far end of supply lines such as the Baltic states being most severely affected. Thus, while the deadline for supplies to Western Europe was formally met, this came at a very high social and political price, making the Soviet leadership skeptical about further deals for years to come. Initial minor supply irregularities, exacerbated by the hurried construction of infrastructure, could be handled by importing countries through interconnection and storage capacity that had been put in place to hedge against insecurity of supply of red gas, again leading Western European companies to view further projects favorably. Notwithstanding limited flow irregularities caused by technical failures, over this period the Soviet Union was regarded to be a reliable supplier and there were no instances of politically motivated supply disruptions. In contrast, Algeria’s Sonatrach repeatedly failed to honor contracts and Norway’s operations were disrupted by numerous strikes. During the oil shock of 1973, even the Netherlands threatened to stop gas exports if other European countries that were not affected by the Arab oil embargo would not share oil resources. 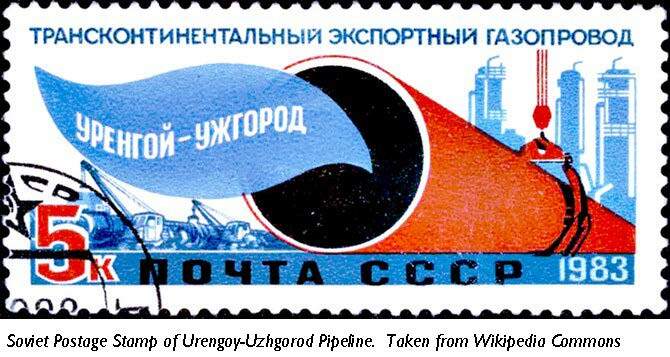 The oil shocks of the seventies also led Mingazprom to renegotiate prices for additional contracts, and a closer tie to oil prices. By 1978, as Siberian gas fields were finally producing large supplies in excess of domestic demand and as European demand continued to grow, Western Europe had to decide whether to scale up red gas imports further, or to avoid higher interdependence. After projects for Iranian imports through the Soviet Union had to be abandoned as a consequence of the Iranian revolution in 1979 (virtual imports for that matter, as physically, Iran’s natural gas imported to Azerbaijan, would be consumed in the Soviet Union’s southern regions, while Mingazprom would export the same quantity from its new fields in the north), a consortium led by Ruhrgas and comprising other “early“ importers of red gas, set out to agree to terms for building of the export-only Yamal pipeline, or Urengoy – Uzhgorod pipeline, which would connect Russian Siberian fields with Western Europe via Ukraine, and Czechoslovakia. Security considerations of the buying countries were again on balance positive, especially in light of the fact that intentional supply disruptions would affect all importing countries along the pipeline route, and it seemed politically unrealistic that – aside for the case of war, for instance – the Soviets would risk confronting major nations in Western Europe simultaneously, on top of obvious economic disincentives. This time, however, in reaction to the Soviet invasion of Afghanistan, the U.S. Reagan Administration strongly opposed the project and imposed export and license restrictions on U.S. entities. Unanimously, the European Community, including Britain under PM Thatcher, refused to follow the embargo and instructed industry to ignore “illegal“ restrictions, which shows that at this stage system-building had reached a considerable “momentum”. Export of crucial compressors and other equipment for the construction of Yamal occurred as scheduled and the pipeline was finalized in 1983, ahead of schedule. The 40 bcm-capacity export pipeline was one of six new Siberian lines taken into operation during 1981-1985. The additional transmission capacities for Siberian gas allowed Mingazprom to reach additional customers in Western Europe. Also, Turkey and Greece were now connected to the unified pipeline system. At the dawn of the collapse of the Soviet Union, which some attribute partly to lower oil and gas revenues during the 80s, red gas exports had thus grown remarkably from a minor 1.5 bcm to Austria in the early 1970s, reaching 63 bcm in 1991. Notwithstanding limited flow irregularities caused by technical failures, over this period the Soviet Union was regarded to be a reliable supplier and there were no instances of politically motivated supply disruptions. This changed after the dissolution of the communist bloc. The breakup of the Soviet Union put transit countries, such as Belarus, Ukraine and Moldova, in a contractual vacuum and the formerly unified Soviet gas system would now have to be governed among newly independent states, leading to persistent disputes and supply crises. Intentional supply disruptions occurred in a number of instances as a consequence of contractual disputes or because of non-payment by off-takers in the CIS region. In some of these cases, commercial motives seemed to be second to Russian foreign policy considerations. Transit disputes have affected importing countries as well, most notably during the January 2009 Ukraine-Russia gas dispute. “Red Gas” will prove insightful reading for both specialists and those whose focus is not energy, as it gives a multi-faceted account of the history of East-West natural gas trade. Despite these insecurities in the post-Soviet sphere, Russian gas supply infrastructure has further expanded, albeit with new pipeline routes, like Nord Stream and South Stream, bypassing some of the traditional transit countries, and supply volumes have continued to grow. As for the future, Russia and its European customers will have to continue to weigh advantages and disadvantages of mutual reliance. “Red Gas” will prove insightful reading for both specialists and those whose focus is not energy, as it gives a multi-faceted account of the history of East-West natural gas trade. Hogselius’ book is valuable reading at a time when debates on energy security are very heated. According to the evidence presented in Per Hoegselius’ book, the role of Soviet and Russian natural gas as an energy weapon has often been exaggerated, whereas the gains from trade and cooperation have been, and will hopefully continue to be, the driving forces of system-development.